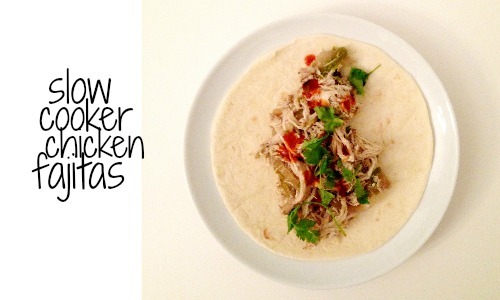 Are you looking for a super easy dinner? 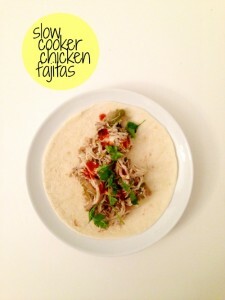 Try these slow cooker chicken fajitas! There is no precooking of anything required, so you’re basically just dumping ingredients in your slow cooker and going about your business. Plus, the ingredients in this dish are pretty simple and you can usually find some great sales on them. Use the item search to find the best current deals on chicken, onions, and more. optional toppings: cilantro, hot sauce, cheese, sour cream, etc. Add the first 6 ingredients (through the salt & pepper) to your slow cooker, stir, and cook on low for 4-6 hours. Remove the chicken and shred with a fork. Place it back into the slow cooker and mix everything to combine. Serve hot with tortillas and your choice of toppings.